Three red stylized Kanji character of O (オ) of Ōita in a circle on white field. O letters represent friendship, faith and diligence, circle harmony and peace. White stands for equality and peace, red for sincerity. Adopted 24 July 1956. White with red circular emblem consisting of three third-cycles with arrowheads. In hoist lower corner three brown ideograms with ?prefecture name? Proportions 7:10. This flag is in Smith 1980 marked as a state flag on land. The prefecture flag was adopted on July 24th 1956 by Notice No 462. The white flag has red prefecture emblem in the center and the kanji name in maroon color at lower hoist. The prefecture emblem was adopted on Oct 5th 1911 by Notice No 351. 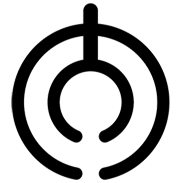 The emblem is stylized kanji 大 O of Oita in a circle form symbolizing friendship of the people and the development of the prefecture.